In December 2011, Lauren’s life was forever changed. Her calendar paused, her career path changed, and her platform increased after a night of injury, or what she subconsciously defined at the time as a “ depletion of beauty”. She was sucked into a plane propeller; the blade cut into her brain and the left side of her body, resulting in the loss of her left eye and left hand. The support she received from the city of Dallas and throughout the nation filled her with humbled gratefulness. Lauren began to realize that brokenness can be beautiful, even amidst unexpected suffering and pain. After her accident, Lauren was in the rare situation of her insurance covering the entire cost of her cosmetic prosthesis, designed by Advanced Arm Dynamics and ARTech Laboratory. She thought this was typical until she hosted the “Beautifully Flawed Retreat” with Bethany Hamilton in 2013. It was there that she met other young women who also had tragic stories of injury, but different stories of obtaining prosthetic limbs that helped in their healing and feeling of wholeness. Many of these women either disliked their unnatural looking prosthesis, could not get one because of the high cost, or were unaware of where to go to receive a beautiful, customized silicone covering for their prosthesis. Lauren began to pray and ask the Lord how she could help those who desired to have a natural looking prosthesis, but could not afford the full cost and at the same time building relationships and sharing the message of true beauty found only in Christ. Two years later, her vision for a faith based foundation became reality as The Lauren Scruggs Kennedy Foundation was formed. Lauren became the bride of Jason Kennedy in 2014 , which also made her a new resident to beautiful California. She is a lifestyle blogger, author of “Still LoLo” and “Your Beautiful Heart”, and launched her hair product “Stranded” in December 2016. Lisa lost her leg below the knee in a motorcycle accident at the age of 16. At that time there had been very few advances in the field of prosthetic limbs. Even through years of pain and struggle and many prostheses, the Lord continued to provide physical and emotional healing. Much of this healing came over 30 years after her accident when she had a wonderful fitting prosthesis made by AAD in Dallas, along with a beautiful, silicone covering by ARTech Laboratory. For the first time her “natural” looking leg provided a new perspective in many areas. Self conscious attitudes turned to confidence as she began having fun with clothes, shoes, pedicures, and even trying to surf. She realized that there were many people, and even prosthetists, that didn’t have the correct information available to them about custom silicone on a lower limb prosthesis. Lisa began to ask the Lord to use her story of brokenness and restoration to bring purpose from pain in the lives of others. She is amazed at the opportunity to work with the LSK Foundation while sharing her faith in Jesus Christ. Lisa lives in Georgetown, Texas with Jim, her husband of 36 years. After a career in the medical field and teaching high school, Lisa loves this new season of life and especially time with her grandchildren. She also serves as an advisor to the Friends of Bethany Hamilton Foundation and is passionate about encouraging women of all ages, sharing with them that the Gospel is "beautiful" in the midst of anyone's story. Ashley became a below the knee amputee at age 8, when the Amtrak train she was riding collided with a semi-truck in March of 1999. Ashley lost her mother, two friends, and niece in the accident, and her right foot was amputated. 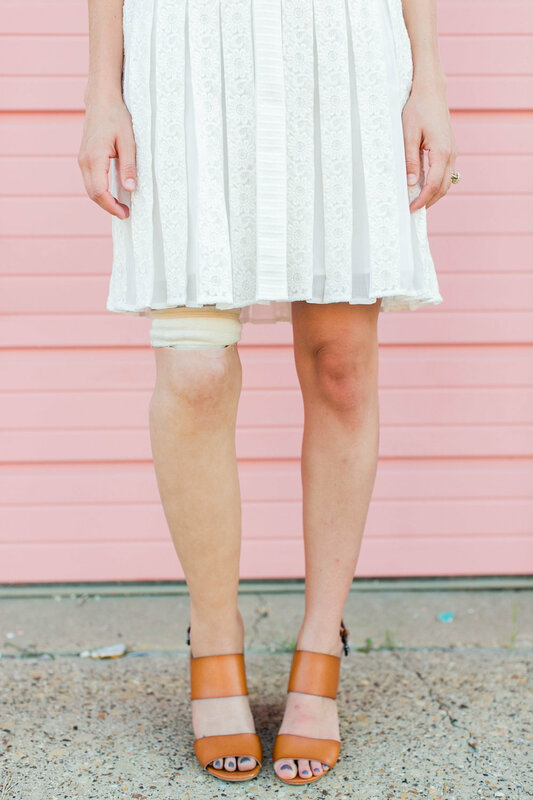 Over the years, Ashley had amazing prostheses that allowed her to do everything from play sports to wear high heels, but until meeting Lauren in 2014, she didn’t know that it was possible to have a prosthesis that looked identical to her other leg. Since receiving her silicone prosthetic covering from ARTech in 2015, Ashley has experienced the confidence and healing that can come from wearing a lifelike prosthesis. She is so excited to be able to work with Lauren and Lisa in providing silicone prosthetic coverings and in sharing the hope of Jesus Christ to girls and women across the country. Ashley is a mental health therapist and is working toward a specialization in play therapy + activity therapy with children and adolescents who have experienced trauma and physical injury. She and her husband Brooks live in Dallas, Texas with their three rescue dogs. The Lauren Scruggs Kennedy Foundation was founded by what has been called a “Divine intersection”. Lauren, Lisa, and Ashley not only met and became close friends, but also realized they had similar stories and an identical vision. All three women had been able to have their prostheses made to look completely real and exactly like their other limb by ARTech Laboratory in Midlothian, Texas. With the many changes in insurance costs and provisions, they also realized that most people no longer had access to custom silicone restorations which could make their prosthesis look real. In 2015, Lauren, Lisa and Ashley were able to accomplish their vision for helping others obtain a “beautiful” prosthesis. Together, with the National Christian Foundation and ARTech Laboratory, they seek to provide funding for girls and women to receive cosmetic silicone coverings for their prostheses, with the hope that they will experience both physical and spiritual restoration and healing. can be an integral part of feeling beautifully complete again”. ARTech Laboratory specializes in providing “the most natural silicone prosthesis available.” ARTech provides beautiful, functional silicone coverings for upper and lower limb prostheses. Lauren, Lisa and Ashley all have a silicone covering from ARTech on each of their prostheses which gives the completely realistic appearance of their other limb. The mission of the National Christian Foundation is to mobilize resources by inspiring biblical generosity. NCF is the largest Christian Community Foundation in the country and facilitates all donations for The Lauren Scruggs Kennedy Foundation at no cost. Funds raised by our foundation go toward the cost of providing silicone prosthetic coverings for applicants who are approved by the Lauren Scruggs Kennedy Foundation. All donations are tax-deductible. Advanced Arm Dynamics is focused on a singular goal: upper extremity prosthetic rehabilitation. That’s a striking difference from the general prosthetic clinic where more than 90 percent of the patients are lower extremity. While most clinics see one or two upper limb patients a year, they see hundreds. Lauren’s arm was designed by AAD with compassionate and caring experts in the field of upper extremity prosthetic options. Strobel Prosthetics & Orthotics is a full service prosthetic and orthotic facility specializing in custom prosthetics. Strobel is well known for their ability to shape prosthetic covers to match the patient's sound side. They work closely with ARTech to achieve the most symmetrical and lifelike appearance possible. Ashley’s current prosthesis was designed by Strobel.